Recent events have left many believers in a state of shock these past few weeks. We received reports that indicated that a rogue group of Abolish Human Abortion (AHA) were out at the church of pastor Emilio Ramos, Heritage Grace Community Church in Texas. We were told that they were protesting the church apparently because they were apathetic to the plight of unborn babies in America for the past 40 years (keep in mind that Heritage has only existed for a hand full of years). AHA held signs and passed out material calling upon the church Body of Heritage Grace to repent for its apathy in light of the 61 million babies who have been murdered through means of the abortion industry. AHA not only held protest signs, but they also spoke to people who lived in the community about the supposed apathy of Heritage Grace toward the genocide of unborn babies who are the image bearers of God. AHA began their efforts to call churches to repentance as it seems they have labeled the primary first cause of the Gospel to be the abolition of abortion. So in that vein, AHA has introduced a venture they call “the Church Repent Project,” where they identify churches that are apathetic or apostate based upon their own subjective standards, and they picket outside their doors until the people know they have been called out for their apathy and compromised unbiblical position of not supporting the true bride of Christ (the AHA). AHA was started with the goals of fighting against the murder of babies in America and pushing for laws which criminalize the murder of babies (Personally I hate the term abortion, we are not talking about popping pimples, or routine medical procedures, this is murder of babies). They have been very adamant about their self-proclaimed mandate to equip local groups to form and work to that end. I get it, I stood in front of State Street and Slaughter Street when no one else did. And yes that is really the names of the streets. I stood there for months completely alone, and prayed and preached and exhorted. Then I was assaulted by two twisted detectors, slapped, hit, threatened, belittled, and mistreated because Adams and Boyles, the two murderers who own the “women’s clinic” paid these nuts’ to assault me. The cops did nothing, and I was there alone. But God is so sovereign that He had my good friend John Barros come straight up to visit and comfort me with something that I believe you all need to hear. I was mad and I shook my fist, and said why isn’t the church out here? Why are they so apathetic? Why did this happen? If all these churches were here we could end abortion today! I was surprised by the question. Of course, after all, I am a card-carrying Calvinist, Doctrines of Grace reciter, a believer in Sola Scriptura, and as such I am as Reformed as a Five point Spurgeonist can be. Let’s just say that I am all in, so when John asked me if I believed God is sovereign I knew it was about to get heavy and I was gonna get corrected. Now for those who don’t know, JohnBarros has logged more time in front of the hardest abortion mill in Orlando Florida than anyone alive. He has had several films produced about his quiet personal ministry. Even R.C. Sproul has said John Barros makes him feel like a weak Christian. There is not an AHA member alive who can touch this brother’s faithful service to God. So when John Borros speaks, I for one am smart enough to shut up and listen. We are swimming in the deep end of the pool now, and I know that John has seen me angry because these murdering so called doctors are there doing their wicked deed. And I have been accusing every single Christian of being lazy and apathetic, saying we need to go get them and they should all be out here doing what we are doing. Now John has thrown me into the deep end and challenged me to actually swim. John looked at me, and he told me he had been where I was at. He was asking these questions, and here was his answer. God used John to show me that I can trust that God is in complete control, and has a purpose for everything. As I learned to trust in God’s Sovereignty over everything, I found myself blaming others less and trusting God to let me do what I could and leave it all up to Him. I have seen many people become the center of their own theological world and play that fool. I have watched well-intended ministries blossom into dens of debauchery and license for a brand of legalism that is borne out of ignorance and antinomianism. See, there is a problem with antinomianism, and that problem is that those who worship God in its arms, slowly become the governors of their own religious legalism and piety. They begin to rigidly define what is and is not church, and what constitutes faithfulness in their own legalistic worldview. Anyone anywhere who does not meet that standard is seen as the enemy, and either put in check of dealt with more permanently. This is nothing new. In fact, John the brother of James and Jesus wrote warning about this very thing in Third John. Diotrephes brought division into the church, and he refused to any and all submission to the Church. John was speaking to the church about this man because he was evil, twisted, power mad, and he rejected the God-ordained authority that is universally recognized over every local church. Diotrephes brought in contention and factions, and he even tried to define what the church was and who was part of it (and who he cast out for that matter). John called him evil and told the church not to imitate evil but rather imitate good. Though John was an Apostle of the Lord Jesus Christ just as James was he did not insist that Diotrophes be excommunicated from the church but rather he exhorted to people in the congregation to not practice the evil that he practices. Diotrephes would not submit to any authority, leadership, correction, or instruction and he was destroying the local church with his wickedness. But even with that said, John did not have the authority to demand of another church that they take any action within their church. There is a spirit of division that comes along that God warns us about. We are warned to watch out for those who cause division, and stir up strife, and we are told to have nothing to do with them. So the question becomes; when is it ever Biblically permitted to protest a local assembly who is preaching Christ and rightly handling the Word of God? It’s one thing to encourage, or practice the biblical principle of exhortation. But you’re in a whole different territory when you pass judgment on others based on your subjective ideology, and declare them to be in sin. To all of you who are running around passing judgment about the ministerial work of Emilio Ramos, Robert Reece, Heritage Grace Community Church, or even that of the local churches you are threatening. God does not take it lightly when you attack the Bride of Christ. Todd Bullis and Matthew Tringali are being encouraged to stir up contention and strife and they need to repent of bringing a reproach upon the name of Christ. 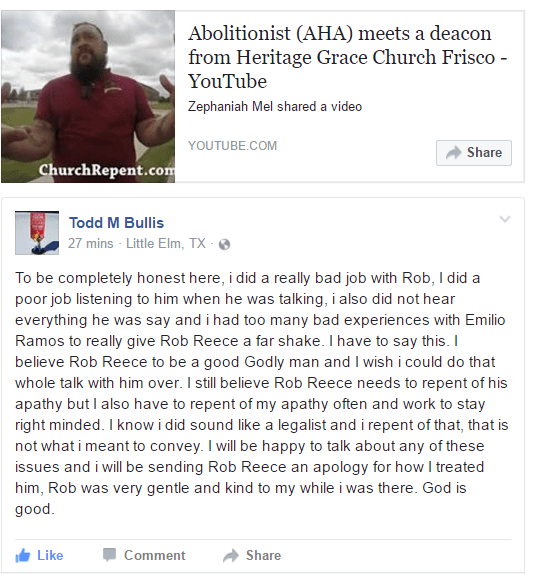 In this link and in the videos Todd Bullis actually says Robert Reece is a good and godly man but he still needs to repent of his apathy. I was amazed as I watched the responses from the unofficial members of AHA (they claim not to have membership of leaders or a structure and that is exactly what the problem is) as they gathered in one voice claiming victim status and telling a narrative that made them the only true bride being persecuted by the wicked unrepentant sinners that spoke against their actions (after all if you are a Biblical Church you will support AHA). According to the Bible Thumping Wingnuts, Len and Tim, a chief criticism of AHA has been that they are against the local church, and there is no greater evidence than the words that come out of T. Russell Hunter’s mouth (the founder of AHA) and the action of their members. Hunter has been the man pushing his own brand of hermeneutics and even said that anyone who opposes the work of Abolitionism or does not support Abolitionism is themselves a Diotrephes. Brothers and Sisters, John Barros was right, while we certainly should be supporting anti-Abortion, or perhaps if your church does not have a murder mill nearby, just maybe you consider supporting someone on the front lines. The point is that even when Paul the Apostle was examined by the church counsel which he submitted to in Galatians 2:1-10 that counsel who had abortions going on in each of their respective communities, did not rebuke Paul and call him to repentance for not practicing pure and undefiled religion as subjectively decreed by T. Russel Hunter. No! When given to opportunity to correct Paul, the only thing they asked him to do was to remember the poor, the very thing I was eager to do. And there is no doubt that the poor was a reference to the poor in the church of Jerusalem. Brothers and sisters if God is using you, rejoice! If you feel compelled to go to the deepest part of Mexico like a close friend of mine just did with his entire family so that he can establish a church to unreached people there, then rejoice. If God is calling you to support those who are going out, rejoice. And please, Brother Robert, Emilio, and sister Trish, and all the church body of Heritage rejoice because if the enemies of God hated Christ they will certainly hate you. Dear AHA, if you are participating in these attacks on the true Bride of Christ, REPENT! Your biggest problem stems from a lack of leadership and no submission to sound doctrine or truth. You have no demands for Biblical Christian church membership in good standing. No elder oversight, and no God-given system of checks and balances. How can you call anyone to repentance if you are systemically unbiblical in your organization? How do you seriously expect to be taken seriously–to even have a voice if you allow yourselves to preach a different gospel than the true gospel which you were taught? If you do not wish to carry on with AHA, let me suggest that you join with us and denounce this, and help us start a new ministry. Local churches seeking to work together to see the end of abortion. We start a new group with Biblical Oversight, policies, and local church approved membership. We refuse to accept anyone who is not a member in good standing at a solid Biblically qualified constituted church. Would you be willing to submit to your pastor and join to End Abortion Now?